Today is Cyber Monday, which means that Thanksgiving weekend in the US is still on, right? So I'm just in time with this Thanksgiving book, right? Last year I was on the Round 2 Nonfiction Picture Book panel for the Cybils awards. Of the books chosen as finalists, 2 were from kidlit virtuoso Melissa Sweet, including the eventual winner, Mrs. Harkness and the Panda. 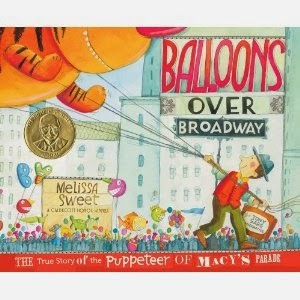 Balloons over Broadway was written and illustrated by Melissa Sweet. The New York City Thanksgiving Day parade is an institution in the US, and this book tells us of the origins of the invention of the giant balloons that make this parade so unique. Tony Sarg was the visionary behind these balloons. The bright colours give as a sense of his playful personality while also bringing us right into the parade. Sweet has a very interesting personal style as an illustrator and I love how her nonfiction historical works often incorporate contemporary media in a scrapbook style. Her attention to detail and method of inserting information in the illustrations via collage are what make her a favourite of kids and adults alike. I hope there is another book of this quality in the 2013 Nonfiction Cybils finalists! This post is for Nonfiction Monday, a weekly Kidlitosphere.